1) Acquire the library. Download it from the website or via a package manager. 2) Install the library. Unzip it to a directory or install it via a package manager. 3) Tell the compiler where to look for the header file(s) for the library. 4) Tell the linker where to look for the library file(s) for the library. 5) Tell the linker which static or import library files to link. 6) #include the library’s header file(s) in your program. 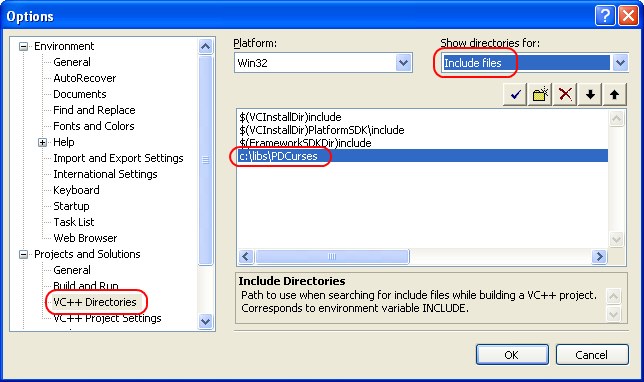 7) Make sure the program know where to find any dynamic libraries being used. Note: The examples in this lesson show screenshots from Visual Studio 2005 express, but the process hasn’t changed substantively since then. Download and install the library to your hard disk. See the tutorial on static and dynamic libraries for more information about this step. We are going to do this on a global basis so the library will be available to all of our projects. Consequently, the following steps only need to be done once per library. A) Go to the “Tools menu” and pick “Options”. B) Open the “Projects and Solutions” node, and click on “VC++ Directories”. C) In the upper right under “Show directories for:”, pick “Include Files”. Add the path to the .h files for the library. D) In the upper right under “Show directories for:”, pick “Library Files”. Add the path to the .lib files for the library. For step 5, we need to add .lib files from the library to our project. We do this on an individual project basis. Visual Studio offers us 3 different methods for adding .lib files to our project. A) Use a #pragma preprocessor directive to your primary .cpp file. This solution only works with Visual Studio and is non-portable. Other compilers will ignore this line. B) Add the .lib file to your project as if it were a .cpp or .h file. This solution works with Visual Studio, but not with many other compilers. This is the solution we recommend. 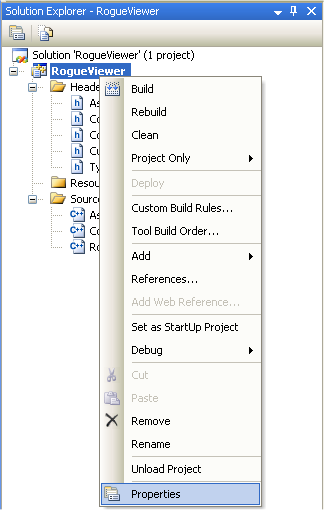 C-1) In the Solution Explorer, right click on the bolded project name and choose “Properties” from the menu. C-2) Under the “Configuration:” dropdown, select “All Configurations”. 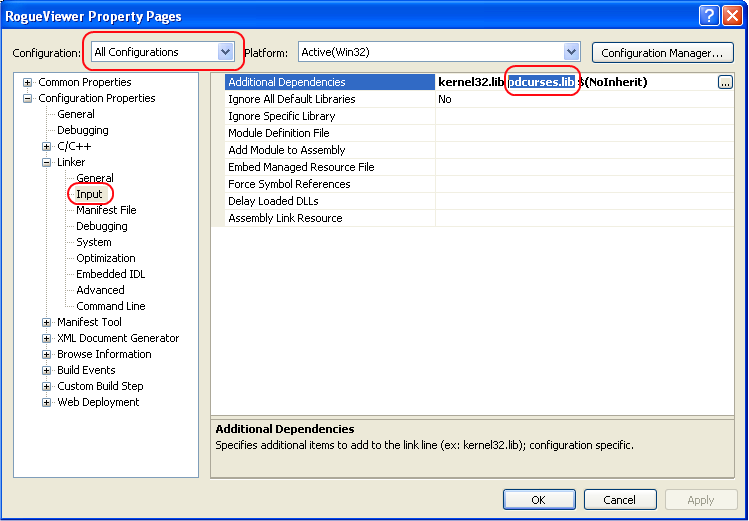 C-3) Open the “Configuration Properties” node, the “Linker” node, and click on “Input”. C-4) Under “Additional Dependencies”, add the name of your library. Simply #include the header file(s) from the library in your project. See the tutorial A1 -- Static and dynamic libraries for more information step 7. I love your tutorials and I have been learing C++ from learncplusplus.com from a long time. You have done a great job. I want to suggest you that threre should be some tutorials on creating static and dynamic libraries. This will make this section complete. 1) Acquire the library. Download it from the website. 2) In directory C:\ create folder "My Libraries" and put in there the Library. 3) In installing V.S. 2017 check the "Desktop development with C++" workload box. 5) Create source file "Main.cpp". 6) In V.S. 2017 > Solution Explorer > right click project's name > Properties. 7) In "Property Pages" window hit C/C++ > Additional Include Directories > down arrow at the end of the field > first icon > three dots > navigate to Library and select folder (usually "include") where headers live. 8) In "Property Pages" window hit Linker > General > Additiional Library Directories > down arrow at the end of the field > first icon > three dots > navigate to Library and select folder (usually "lib") where .lib files live. 9) In "Property Pages" window hit Linker > Input > Additional Dependencies > the down arrow at the right of the field > Edit > copy the names of .lib files and paste in top-most text box. 10) In "Property Pages" window hit Apply > OK.
11) Navigate to Library where dll files live copy them and paste in project-folder. 12) From a tutorial about this Library copy a program code and paste in Main.cpp. 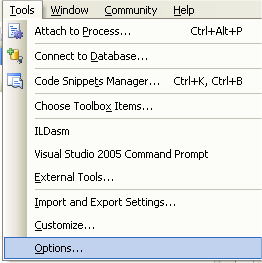 13) In Visual Studio main menu hit green arrow or press Ctrl + F5. Note: It's not that every Library demand all above steps. For example Graphics Library with Mathematics (GLM) only demands configure Additional Include Directories (step 7). Thanks Georges. This lesson is due for an update. I'll make sure this nice bit of feedback is incorporated when I do. Please let me add that user can create Template (by click Project in V.S. main menu > Export Template...) with the first project, so that for new project only needs copy dll files, if any, and paste in new project-folder. VS2005 Express? Now on VS2019 preview (and VS2017 Community), isn't this section a little out of date Alex? Surely it could use an update (when you have the time of course). Definitely needs a holistic update, and is on the to-do list. In the meantime, I've updated the title, since the content should still be relatively accurate. Dear Teacher, please let me suggest you begin update from title: "Using libraries with Visual Studio Community 2017". Regards. Dear Teacher, please let me suggest you, when update this lesson give following links to your readers as examples of setting up libraries in Visual Studio 2017. Thanks! I'll look through these. It would be nice to update this for Visual Studio Community 2015, because Tools>Options>Projects and solutions>VC++ Directories is not a valid way to set library directories anymore. I use your post but LNK2019 and LNK 2011 error happened at function ArPrintString. how can i fix errors? I am struggling in VS10 to do same. Please provide same steps using VS2010. What about an article on exporting functions from DLLs, rather than using a LIB file. Many DLLs seem to have undecorated (non-mangled) functions when listing them using dumpbin.exe. Sure you can do this using a extern 'c' directive, but that doesn't work for classes (especially with their constructors/deconstructors since they have the same name). Some explanation of using MOdule Definition (*.def) files would also be helpful. Muito obrigado! Muito obrigado mesmo!! it doesn't have a .lib file so I get confused at 5.
how do I include simple .h files in VS? thanks a lot dude..keep it up..god bles u..! !